Review of "Researching Language and the Law – Textual Features and Translation Issues" by Davide Simone Giannoni and Celina Frade (eds. ), Bern [et al. ], Peter Lang 2010. The papers of this volume were first presented at an international conference organised by CERLIS (Centre for Research on Languages for Specific Purposes) in June 2009, and they were published in Peter Lang´s series "Linguistic Insights – Studies in Language and Communication" in 2010. The volume contains many interesting studies on language and the law that are welcome contributions to research in the field. However, in my opinion, the primary reason why a review still seems relevant almost two years after publication is the overarching aim of the book, as indicated by the title: Researching Language and the Law. The editors have inspired the authors to address the fundamental question that any researcher in the emerging field of Law and Language, Language and the Law – or Legal Linguistics – should ask himself or herself from time to time: What is the purpose of investigating the interface of language and law, how do I do it, in whose interest is research in the field conducted, and how can my own disciplinary perspective contribute to defining the scope and directions of research in the field? Some of the authors explicitly confront such fundamental theoretical and methodological questions, others only implicitly, but all contributors clearly state the aim and purpose of their work, what research questions they want to investigate and what methods they apply. Such research virtues are by no means always taken seriously – especially not in edited volumes. One senses a strong editorial hand in encouraging the authors to reflect on the methods they apply. However, when it comes to the overall structuring of the contents of the book, it shares the weakness of most edited volumes: the lack of a convincing link between the subject matters. Given the welcome focus on research methods, the volume would have benefitted from a corresponding clarification of the diverse topics that may be treated in the name of the discipline of Law and Language, accompanied, perhaps, by a discussion of what should count as the core issues of the discipline. Instead, the editors tend to oversell the book as a volume in which "[t]he contributors discuss the impact [of globalisation] on the construction, evolution and hybridisation of legal texts". This is indeed one of the aspects treated in the volume, but it applies only to some of the papers (KERMAS, POLESE / D´AVANZO, TURNBULL, BAAIJ). In that respect readers expecting a focus on language in global legal settings may get disappointed – even though all contributions are of high academic quality. The strength of diversity, however, is that readers may pick and choose from a broader variety of subject matters and thus, incidentally, get inspired from research themes and approaches that they would otherwise not get acquainted with. The difficulty of reviewing an edited volume is to give credit to each and every contributor without tiring the reader. I have not tried to solve this problem; on the contrary I have chosen to focus on four contributions that treat EU law and language. My reason for doing this is that most readers of Zeitschrift für Europäische Rechtslinguistik are interested in exactly that topic. I try to compensate for my narrow focus by also addressing more general questions concerning the interdisciplinary character of the discipline of Law and Language. I would like to stress that leaving out the resting papers does not imply that they are not worth commenting on or reading. They are! The four contributions dealing with aspects of language use in the EU treat as diverse topics as French influence on European legal English (KERMAS), legal and linguistic vagueness in EU directives (POLESE / D´AVANZO), a comparative analysis of the rhetoric used by Italian and British Advocate Generals in judicial opinions (TURNBULL), and translation methods adopted in the EU legislative procedure (BAAIJ). Not only do the topics differ; so do the levels of analysis and the research methods applied by the four authors. "is determined by [the] long-standing role [of French] as the language of diplomacy and its representativeness in working commissions within the EU" (p. 53). Her method is comparative corpus analysis and her research design is careful and systematic, based on two distinct corpora: the French and English versions of EU legislation, the French and English used in national legislation in France and the UK, and a reference corpus consisting of texts drawn from the internet that document the variety of English used in British and American academic and media discourse. "fact that English is used as a lingua franca worldwide makes it extremely susceptible to change and partly explains why it has readily adapted to foreign influence" (p. 66). The study is a welcome comment to the general regret that English is dominant in global – and European – legal discourse. This dominance cannot be denied – and there are, of course good reasons for regretting the accompanying decline of linguistic diversity and multilingualism. However, it is important to add to the general picture that the dominant English language is a weak, hybrid English that does not belong to anybody, least of all the English. "is not on crystallized vague lexis or formulaic expressions but on vagueness carriers which call for negotiation of meaning and may reveal ideological implications" (p. 94). "How and in what direction is the language of the directives under scrutiny accountable for the representation of migrants? How and to what extent are ideological implications accountable for vagueness in the directives? Can power roles be operationalised through vagueness?" (p. 89). This contribution belongs to the tradition of CDA – critical discourse analysis, the objective of which is to uncover hidden power relations in society through detailed text analyses. Sociologically informed discourse analysis is a methodology applied across a great variety of disciplines, and, as I have identified elsewhere 1, legal scholars studying law from a sociological / contextual point of view seem to be increasingly interested in legal discourse and discursive processes in law and society. In my opinion the analysis by Polese / d´Avanzo suffers from a problem often facing the researcher applying CDA – that one tends to overemphasize the importance of the language of the texts under scrutiny. While I find the study interesting from a linguistic point of view, I don´t think the authors fully allow for the political and legal context that constrains EU legislators when introducing common rules in the field of immigration and asylum law. Concluding, as the authors do, that the EU leaves too much discretionary power to the Member States by using vague language in the relevant directives is not convincing. Discourse analysis is a powerful tool to detect conscious or unconscious lexical choices dominating a specific discourse, but the lexical analysis must be supplemented by a wider politico-legal analysis. In this case, questions of legitimacy of the EU institutions and the role that subsidiarity plays in the legal interaction between the EU and the Member States must be taken into account as well. "to assess whether the language, style and rhetoric of the Court of Justice (in their judicial opinions delivered at the court) reflect the ongoing process of harmonisation in European law" (p. 135). The method adopted for the analysis is a combined quantitative and qualitative analysis of a corpus consisting of 40 opinions selected at random from 1998 to 2008. The focus is on two elements of the language of the AG´s: expressions that indicate the judge´s attitude and position towards the message; and expressions of politeness. "accommodation of the judges to a new legal context"
" ,betray´ the origins of the AG". "the Opinions of Advocates General can be considered as hybrid texts". "In terms of harmonisation […] the degree of adaptation that has taken place creates a consonant whole"
"the diversity and individuality of the AGs´ legal cultures still filter through and characterise their Opinions" (pp. 151-152). As stated in the title of the paper Turnbull´s approach is a linguistic one, and her ambition is clearly not to discuss the role that the language of the opinions plays in the process of legal harmonisation as such but simply to look for signs that suggest a corresponding linguistic harmonisation. In that sense, the analysis is more concerned with legal language than with legal culture, and the title is somewhat misleading. Nevertheless, the results are relevant and interesting – also for lawyers working in the field of Law and Language. The last paper that I have decided to comment on is the one by Cornelis J.W. Baaij, "Translation in EU Legislative Procedure: A Receiver-Oriented Approach". Baaij holds a law degree and conducts legal research at the University of Amsterdam´s School of Law. He is one of three lawyers among the authors of the volume. Is it possible to detect a difference in his approach to studying Law and Language as compared to the contributors with a linguistic background? To me it is apparent that Baaij is more concerned with the legal framework and legal consequences of translation in the EU than with the linguistic aspects of translation. His intention is to convince translation scholars that - for legal reasons - a receiver-oriented translation method generally preferred among contemporary translation scholars is not possible and recommendable when translating EU legislation. He speaks as a lawyer to linguists. Hence, you could say that he invites to a debate, and it would have been welcome, if the editors had actually invited a translation scholar to comment on his suggestion. This would have facilitated a dialogue across the perspectives entailed in the different disciplinary outlooks of lawyers and translation scholars. My general impression is that researchers in the field of Law and Language, or Language and Law, are not fully aware of their different disciplinary outlooks and the possibly conflicting – but mutually enriching - positions that they have. 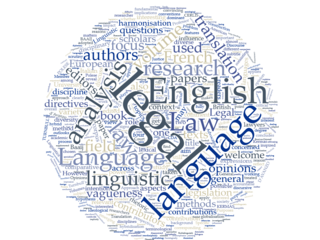 If the field should gain from researchers cooperating across disciplines, it is important to enable an exchange of diverse views on the role of language in law. The editors of the book are both professors of English specialized in researching legal discourse. Davide S. Giannoni is an Assistant Professor at the University of Bergamo in Northern Italy and affiliated to CERLIS; Celina Frade is Professor of English for Specific Purposes at the Rural Federal University of Rio de Janeiro, Brazil. The subtitle of the book (Textual features and Translation Issues) is not only too broad; it also reveals the linguistic background of the editors. Lawyers editing the same papers would almost certainly not have chosen the same subtitle and hence organization of the papers. "The contributors discuss the impact [of globalisation] on the construction, evolution and hybridisation of legal texts"
which applies only to some of them. In the end, the contours of the emerging discipline of Law and Language, Language and the Law or Legal Linguistics, are still not clear enough to allow for an exclusion of perspectives, and the selection of articles is welcome, and each individual contribution valuable and readable. Davide Simone Giannoni & Celina Frade (eds.). Researching Language and the Law – Textual Features and Translation Issues. Bern [et al. ], Peter Lang 2010. ISBN: 978-3-03-430443-6. 1 A survey of the member list of the interdisciplinary network RELINE has shown that "discourse" and "discourse analysis" are among the key words that researchers have indicated across law, language and neighbouring disciplines. Kjaer, Anne Lise (2012). 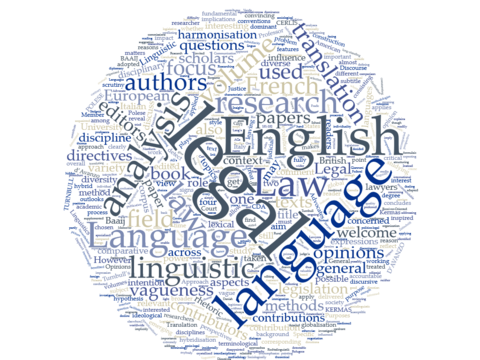 „Investigating the Interface of Language and Law: Methodological Perspectives. 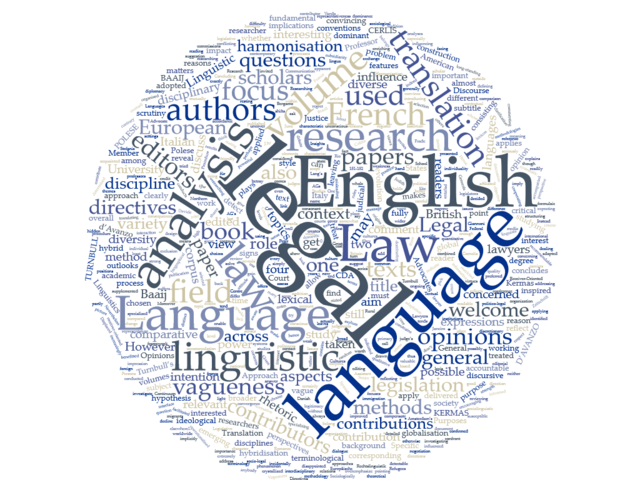 Review of „Researching Language and the Law – Textual Features and Translation Issues““. Zeitschrift für Europäische Rechtslinguistik (ZERL). Köln: Europäische Rechtslinguistik, http://zerl.uni-koeln.de/kjaer-2012-rezension-investigating-language-law.html, (Datum des letzten Zugriffs). URN des PDFs: urn:nbn:de:hbz:38-74479.